to each pediatric cancer patient upon admission to the hospital. On one of her earliest visits to the hospital, Alexa noticed that the hospital towels were scratchy and uncomfortable on her bald head. She asked her parents to bring a fluffy character towel from home, which she found soothing and more comfortable. In spite of everything she is facing in her own fight against cancer, this gave her an idea to help other children. 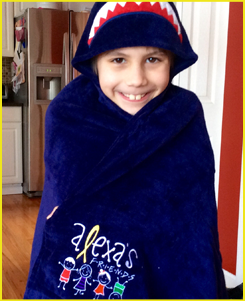 She decided to raise money to provide a nice, fluffy character towel to each pediatric cancer patient upon admission to the hospital in the hopes that it would brighten their day and make their stay at the hospital just a little more comfortable. My name is Alexa and I am 11 yrs old. I want to give you a special gift to let you know you are not alone in this journey. "Once you choose hope, anything is possible."